When meeting new people, sooner or later one is invariably asked “What do you do?” In my case, after providing my go-to brief description of Manuscript Studies, it is nearly always followed with “How did you get into that?” Consequently, I’m often reminded of my first manuscript experiences, and also of the early (mis)conceptions I had about their production. Initially, I always pictured a tidy row of tonsured monks stationed at their desks, painstakingly copying out the texts before them. These men silently worked together, not only in a collaborative sense, but also physically; without fail, I imagined their activities happening simultaneously, and very much defined by shared space. In my manuscript-making vision these scribes always worked in a room purpose-built for their task, i.e. the scriptorium. The scriptorium in The Name of the Rose. While this impression isn’t wrong per se, it is easily complicated. The social sense of ‘scriptorium’ as a group of scribes working according to collective standards and methods (for example, in a house style) with shared resources, goals or projects is obvious. Identifying several hands within a single manuscript is common (a whopping 24 hands are found in Tours’ Moutier-Grandval Bible, c.840) and ongoing collaboration between individual scribes has been demonstrated in many collections (ex. that of late 11th-early 12th century Salisbury as shown by T. Webber). 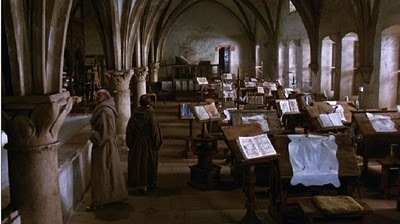 The physical scriptorium, meaning a space designated for manuscript making, is a hazier matter. Eadwine hard at work, The Eadwine Psalter (Cambridge, Trinity College Library, MS R.17.1) fol. 283v, c. 1155. However, very little evidence attests to the existence of physical scriptoria throughout most of the middle ages. While the St Gall Plan (c. 820) provides for a scriptorium, the Plan was never realized, nor do any other archaeological or literary remains provide adequate indication of such a specialized space at any contemporary or earlier monastery. That is not to say monks did not write together; they may have carried out their work elsewhere in the monastery, for example in the multi-purpose cloister, weather permitting. Still, a normal cloister walk could hold around 12 desks. According to Bruckner, about 100 scribes worked at St Gall between 816-836. If scribbling away in a single place, they must have worked short shifts indeed. Plan of Saint Gall, Cod. Sangallensis 1092. 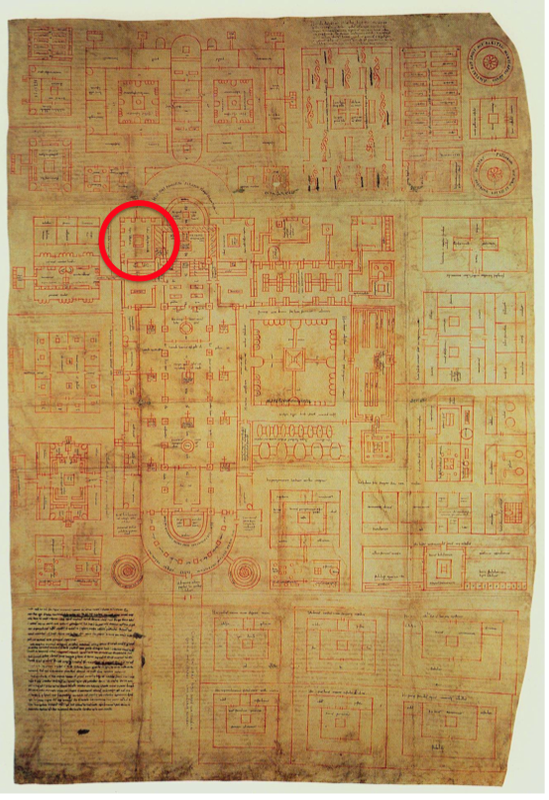 Scriptorium above the library, indicated in red. Of course, the physical environment of scribes grows clearer in the later middle ages. According to Abbot Herimann of Tournai, if you had visited his abbey at the turn of the 12th century and entered the cloister “you might have seen a dozen young monks sitting on chairs in perfect silence, writing at tables carefully and skillfully constructed.” From the 13th century onward cloister carrels were perhaps used for copying. 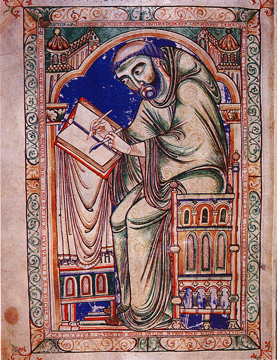 The chapter house, an increasingly standard structure from the 11th century on, may have served as a part-time scriptorium, or its upper floor used as a dual-purpose library-scriptorium as at St Alban’s. Further, with the rise of orders whose monks lived in cells, copying was also carried out there by lone scribes (as perhaps it had been done by canons in their own residences for centuries). 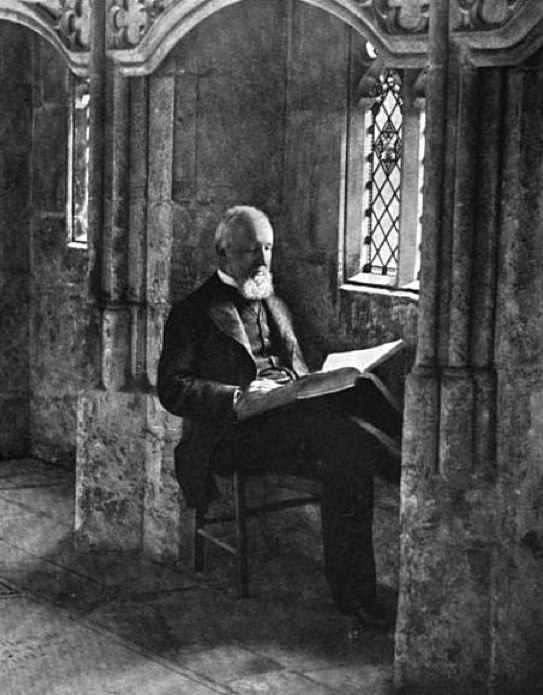 A gentleman enjoys a book in one of Gloucester’s south cloister carrels. For me, breaking my early rigid notions about the physical environment in which manuscripts were made is a perfect example of why I find my field so exciting. As I’m conducting my dissertation research, I’m often hit with an ‘aha!’ moment, nudged by a paradigm shift, or smacked with a new question to ask my sources about the ‘hows and whys’ of manuscript production. Admittedly, I also like to think that my project members and I are working, in a way, as a little scriptorium: toiling away diligently in our offices, (albeit not by any means silently!) both individually and collaboratively, under the guidance of a Master scribe, or in our case with Erik, Master codicologist. This entry was posted in Jenneka Janzen and tagged Medieval Scribes, Monastic Scriptorium. Bookmark the permalink.